I recently returned from a trip to northern Italy, where I toured farms, composting and anaerobic digestion (AD) facilities, mountain communities with advanced collection schemes, a zero waste Slow Food event, and more. The food, wine and culture were fabulous, and I will share what I can in this series of posti ngs. vehicles are able to navigate the narrow medieval streets. A combination of several initiatives have led to the community's success. Residents are given 200 compostable bags per year (made from Mater-Bi), and there is a ban on plastic bags at supermarkets (only reusable bags and compostable bags permitted). Organics are collect is free, whereas trash collection is charged by volume. One of the interesting facets to Val di Fiemme is that it's a popular tourist destination, both in the winter for skiing and in the summer for hiking. During those times, the year-round population of 20,000 doubles. Tourist are given compostable bags, as well as cardboard boxes for their organic waste -- no collection pail abandoned on the street, when they leave. Tourists are also given pink trash bags, different from typical residents, which are to left on the curb witho ut a bin. Trash on the street in other colored bags is considered litter, to encourage use of the system. Other campaigns include encouragement of tap water instead of bottles, as well as bulk items at supermarkets to reduce packaging. Bulk dispensing includes typical items such as cereals, but also wine and soap. Most notable of these bulk dispensers is fresh, raw (unpasteurized) milk available at some sto res. One local farmer is assigned to each store, providing fresh milk supplies daily, and customers use refillable glass bottles. The milk quality is controlled at the farm, so there is no need for pasteurization, and the customer knows which farm the milk is coming from. The largest area of organic waste remaining in the residual stream are baby diapers, so the public company in charge of waste collection now promotes reusable cloth diapers with compostable liners -- families are given an initial set of cloth diapers as a welcoming gift for each newborn! Val di Fiemme has a strong lumber business, resulting in large quanities of wood waste. There is now a biomass powered boiler facility that provides municipal heat via underground pipes to the ho uses for the cold winters. Upgrades are underway to make it a combined heat and power facility. There are some PVC solar panels on the roof. Most areas of the U.S. don't have curbside collection of organic waste as part of their municipal service. However, there are innovative haulers all over that are beginning to collect organic waste from businesses. These haulers not only help businesses reduce their waste b ills, and give compost facilities necessary feedstocks, but they demonstrate the need for organics collection -- communities want to make more environmentally sound choices, and these haulers are giving more options. The organics are taken to Crowell Farm, a former dairy farm that accepts yard trimmings, manure, food scraps (including meat), food soiled paper/cardboard products, and more. Danny's Dumpster was recently featured in a local ABC news video. CAFOs, or confined animal feeding operations, are increasingly turning to composting for nutrient management programs (voluntarily, or sometimes mandated by the government). Two facilities I've spoken with recently are using fabric buildings to cover their composting operations. Fabric structures are inexpensive, corrosion resistant, and provide natural light and ventilation. 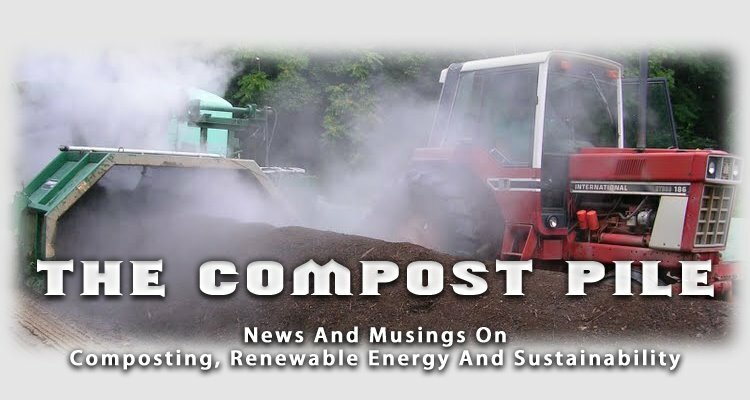 Terra-Gro is a composting operation located at a CAFO in Peach Bottom, Pennsylvania. “We take in starchy potato waste from a nearby potato chip factory, and mix it with manure and crop leftovers,” says Loren Martin of Terra-Gro. 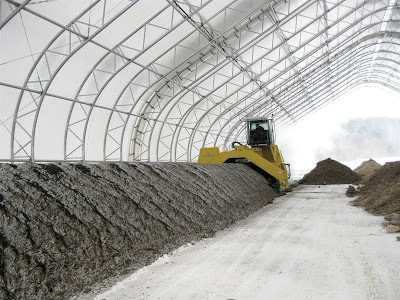 “We compost the mixture in 6-foot by 12-foot wide windrows, housed in fabric structures.” Martin has several of these buildings, each 60 by 400 feet long. “Because we compost in the fabric buildings, the product is very consistent and attractive to higher end markets," he says. Another CAFO using fabric buildings is Laurelbrook Farm in East Cannan, Connecticut. It currently composts dairy manure from a heard of 830 cows, mixed with crop residues and horse bedding from nearby farms. Laurelbrook has four fabric buildings made by ClearSpan: one for tipping, two for active composting, and one for curing the finished compost. The farmers are looking to accept food wastes, and are also planning a community anaerobic digester with nearby farms to produce renewable energy prior to composting. Although CAFOs are often unsustainable, these two farms are working hard to improve there environmental footprint. I've across a few articles on local food recently that are a cut above the fray. They touch on issues of climate change and vegetarianism, and reference studies conducted on the impact of our food choices. From World Watch magazine, "Is Local Food Better?" is a well researched article that explores the meaning of local food, tradeoffs involved with that choice, and the notion that what you eat matters as much as where it comes from (dairy and meat have a larger impact environmentally than veggies). The ecological harm of raising and consuming meat is given front and center attention in a Washington Post article, "The Meat Of The Problem." It cites hard-hitting reports that are difficult to refute, such as a United Nation's report that attributes 18% of worldwide greenhouse gases (CO2 equivalent) to livestock. But it also has a personal angle, talking about sacrifices that we can all make as part of taking global warming seriously. Although there are a dozen more articles, the last one for right now is a short and sweet success story. "Produce Truck Encourages Healthy Eating In Detroit," Associated Press, tells of how the Peaches and Greens truck travels the streets of Detroit, selling produce like ice cream. Says author David Runk, "The truck set up like a small market brings affordable produce to families on public assistance, homebound seniors and others who can't reach the well-stocked grocery chains in the suburbs." The Princeton Review's 2010 annual guides include green ratings for colleges and universities. It gives green ratings to 697 colleges, a 30% increase in the number of participants from last year. The Princeton Review rates schools on a scale of 60 to 99 in eight categories, including the green rating. This category was developed in 2007 with ecoAmerica, a nonprofit that helped launch the American College & University Presidents Climate Commitment, among other programs. The criteria cover three broad areas: whether campus quality of life is healthy and sustainable; how well the school prepares students for employment and citizenship in a world with environmental challenges; and the school’s overall commitment to environmental issues. The Princeton Review also announced the “2010 Green Rating Honor Roll,” of 15 schools that received the highest possible score of 99: Arizona State University at the Tempe campus, Bates College, Binghamton University, College of the Atlantic, Colorado College, Dickinson College, Evergreen State College, Georgia Institute of Technology, Harvard College, Middlebury College, Northeastern University, University of California, University of New Hampshire, University of Washington, and Yale University. A new section of Princeton Review’s website is dedicated as a resource area for students and others interested in learning about the ratings and benefits of attending a green college. It includes information on colleges with exemplary environmental programs, questions to ask on school visits, and links to organizations that promote higher education and campus sustainability programs. Check it out at www.princetonreview.com/green. Here are some more photos from my tour of Growing Power in Milwaukee, October 2008. Below i s an old household clothes dryer that Will Allen adapted into a compost screen -- he told us that it's common for the heating element of dryers to burn out, but still have a working motor, making them a common but useful discard. All vertical space is utilized in the greenhouses. Some of the hoop houses outside are heated solely by the composting process, with active piles o f brewers grains and wood chips in the corners. They provide enough heat throughout the Milwaukee winter to keep the hoop houses above freezing - warm enough to grow hardy greens like spinach and kale. There is also a productive apiary of bees for urban honey. A new Zagat guide will feature New York City's green restaurants. To be released this month, the guide is printed on 100% postconsumer recycled paper. Yes, composting is listed under Waste Reduction and Recycling. Under the new rating system, dubbed Green Restaurant 4.0, there are three possible rankings for certified restaurants: Two Stars (minimum of 100 points), Three Stars (minimum of 175 points) and Four Stars ("trailblazers" with a minimum of 470 points). GRA works in four main sectors: Restaurants and other Food Service Facilities; Manufacturers; Consumers; and Distributors. Unlike a lot of "green washing," where companies capitalize on the popularity of sustainability by marketing superficial green aspects of their business, GRA provides valuable tools, and showcases establishments that are making significant environmental choices. As part of its consumer outreach, GRA has a search engine for finding certified restaurants across the country. Look for a Certified Green Restaurant! Following the mantra reduce, reuse, recycle, there are plenty of people who reuse trash for practical applications. I find making art out of trash one of the most interesting -- taking discarded objects that have no value to one person, and transforming them into something most people would find beautiful. a garbage company, albeit one of the most progressive in North America. Recology (formerly known as Norcal Waste) is responsible for hauling San Francisco's garbage, recycling and compostables, and has an "Artists In Residence Program" at its transfer station: they provide 24-hour access to a well-equipped studio, a monthly stipend, and an exhibit at the end of their residency. They only stipulation is that the artists use materials gathered from San Francisco's refuse. One of my favorite artists from the program is Nemo Gould, who was in residence in 2007. 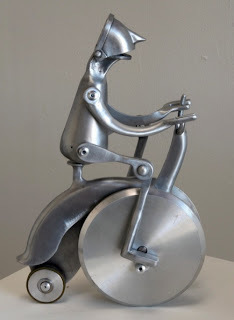 His sculpture of HiWheel bicycle (above) is composed of a discarded garlic press, bike brakes, melon scoops, a circular saw blade cover, rivets, a shot glass and fly wheels. 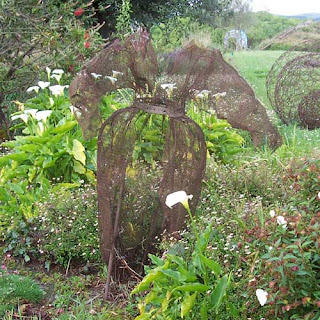 There is also a sculpture garden at the transfer station. Estelle Akamine's Ball Gown is particularly stunning (left). Recology claims this may be the only "art park" at a garbage company. Do you know of any others? This program has been active for the past 18 years! Check out all of the creativity -- here's a full list of Artists In Residence at the San Francisco dump. I keep coming back to an Op-Ed piece from the New York Times written by Wes Jackson, who founded the Land Institute, and Wendell Berry, a farmer and writer in Kentucky. These two "practicing environmentalists" are leaders in the field of sustainable agriculture. "A 50-Year Farm Bill" (January 2009), commends the efforts being made by thoughtful farmers and consumers, but also details the environmental severity of America's industrial agriculture. They prescribe stronger government policy with a longer-term vision, one that supports healthy soil and sustainable food production, rather than oil-dependent agribusiness. There's a lot of buzz about compostable products, as companies attempt to become green. These are products, from cups to cutlery to bags, that are designed to biodegrade in a composting environment. This industry is huge -- International Paper just sold its one billionth ecotainer, making it the most common compostable product (right). It's essentially a paper cup, but is coated with a special plastic made out of corn that is designed to break down in a professionally managed co mposting environment. In this case, the ecotainer is covered with PLA (polylactic acid) manufactured by NatureWorks, under the brand name Ingeo (left). In the U.S., the Biodegradable Products Institute (BPI) approves certifies products that meet ASTM (American Society for Testing and Materials) standards, and provides a label. 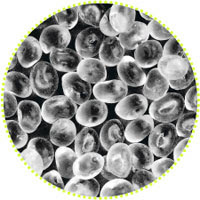 EarthCycle products (above) can be found in the fresh produce sections of several large retailers, including Wal-Mart, Whole Foods, Wegmans, Trader Joes and Publix. 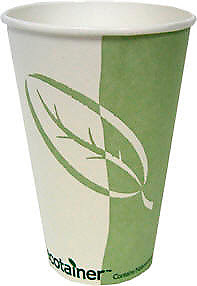 For more information on the range of compostable products on the market, check out my article, "Compostable Products Go Mainstream," published in the July 2009 issue of BioCycle magazine. The Environmental Protection Agency put together a great video on using food scraps to create renewable energy. This educational video is a great example of successful public outreach -- it is general enough for the public audience to understand the basics of anaerobic digestion, and explains where government funds are being used for renewable energy research (the project was funded by EPA Region 9). For more information, check out the EPA's webpage on the food waste project. San Francisco has led the way in the U.S. for curbside collection of organics. In 1999 the City and County of San Francisco rolled out its residential three-stream curbside program as a pilot project. Often referred to as the Fantastic Three, the bins are for trash, commingled recyclables, and compostables (yard trimmings and all food waste, including meat and dairy). They finished expanding the service citywide to all 150,000 households in 2004 (130,000 single-family and 20,000 buildings with five or fewer units), and now are tackling multi-family apartment buildings. I wrote an article about how a hauler in San Francisco promotes the program using 3D images on its collection trucks to communicate the value of source separated organics: "Food Waste Diversion Promoted On The Street." San Francisco recently passed an ordinance making source separation of organic waste and recyclables mandatory. This is groundbreaking! While several other cities require recycling service and participation, San Francisco is the first in the U.S. to require the collection of food scraps and other compostables. This move is in part a response to findings from study conducted by the city's Department of Environment, which found that 36 percent of what San Francisco sends to landfills is still compostable (primarily food scraps), and 31 percent is still recyclable (mostly paper). This new ordinance will help move San Francisco forward to its goal of becoming a Zero Waste city by 2020.